Diary of a Psychic Healer: Can Energy Healing Be Miraculous or Instantaneous? Can Energy Healing Be Miraculous or Instantaneous? Healing can happen in an instant. There may be cases where we need to heal and release dozens of beliefs, feelings and patterns, but that doesn't mean that it will take months of healing and introspection. How this plays out will vary person to person, for example, a simple headache can evaporate on the spot, or maybe a childhood belief vanishes and we are no longer painted into a corner. Often, it is felt as a deep relaxation and knowing that we have nothing to worry about - or that we can handle what is in front of us. Releasing BELIEFS is HUGE. In both of my books - the first an energy healing and meditation guide for families that are coping with cancer (HERE), and the second, a creative Chakra Healing adventure (HERE) - I discuss beliefs: how they shape the way we view the world, how we interact with others and how beliefs can paint us into a corner. Beliefs can generate lots of unnecessary stress, especially if they lower our self-esteem or confidence. How do we spot those beliefs? Theta Healing involves a technique where we use muscle testing to identify beliefs that can be held on different levels - in the body, subconscious or our spiritual DNA. There is a whole process where we use relaxed brain states to guide the client (or yourself) through a series of questions, looking for the false belief that props up all other beliefs. When we remove that belief, the Jenga tower crumbles and the obstacle disappears. I really like Theta Healing and knowing myself, I will probably take all of the workshops at some point. But a few days ago I got to thinking... Why do we have to be so specific with the belief clearing? So I tried something not recommended in class: I used the Theta Healing meditation & script to release all spiritual or religious beliefs, replacing them with pure light and with the feeling of unconditional love. The beliefs that I wanted to remove were the ones that humans tend to argue over when it comes to religion - and just generally ideas about spirituality, energy or vibration. It felt amazing and I went on to clear beliefs related with lots of topics, replacing them with light. In class, we were advised to search for limiting beliefs and leave in place the empowering ones. But my intuition tells me that pure light is an excellent substitute; that light has more oomph than any of us do. I think it is important to listen to our intuition and let it guide us, as classes and training give us tools but they won't always be a perfect fit for our situation. Then I thought, wouldn't it be cool to focus my Reiki self-healing sessions on specific themes - say money, love, career, prosperity or friendship - and set the intention on healing and releasing anything that might be limiting the way that I experience those qualities? Rather than use Theta Healing to sort through enabling or limiting beliefs and possibly never find the right one, I could channel Reiki through my body, with the intention to transmute any beliefs, feelings or filters that paint me into a corner. Based on what we learned at the School of Intuition & Healing; beliefs, patterns, and social conditioning can be cleared by focusing on the Chakras, the Aura, and the body. So from a Reiki point of view, I chose one of the above mentioned themes and used the symbols from the 2nd degree of Reiki to send healing to the past (Distance Symbol), clear anything that might be blocking that quality (Harmony Symbol), and filled that space with a fresh burst of energy (Power Symbol). After that, I visualised the Reiki Master symbol around me, filling my body and Aura with light. In school we learned to clear energy from the Aura - or any space - and then fill it with light. Reiki is one of many healing modalities, for example, I have studied three different approaches to Energy Healing and they can all be focused on belief busting. So don't worry if you haven't taken a Reiki class - even though I would really recommend Reiki Level 1 just because it is so simple to apply in our daily lives. This hourlong webinar is based on my energy healing studies. It involves a guided meditation to channel healing through the body, Aura and Chakras. I would use this channeling technique in combination with the Energy Basics page on my blog, using your hands to direct healing through the 7 chakras and the Aura. 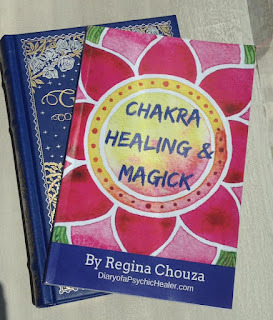 Check out my Chakra Healing & Magick book for an overview of the Chakras in the 2nd chapter, including a guest post by Maria Veiga, psychologist and author of the The 7 Lies of the Human Race. Then turn to Chapter 5, Exercises 1-3, to learn to channel energy healing through the Chakras. The energy healing techniques in this chapter are based on the healing course at the School of Intuition & Healing in London. - What Do I Mean by Miracles?